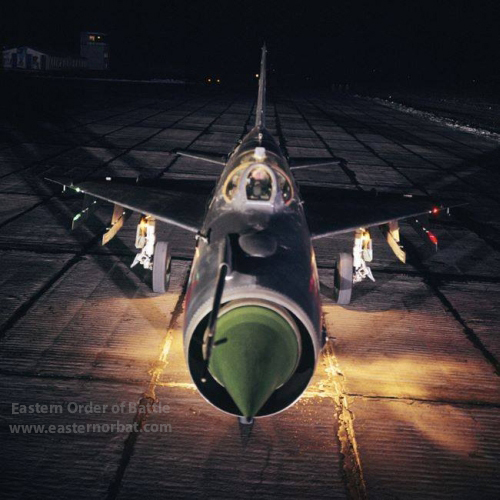 At the turn of the sixties and seventies the MiG-21SM Fishbed-J was one of the world's best light fighters. The MiG-21SM Fishbed-J featured the new R-13-300 turbojet, a built-in GSh-23L gunpack and an improved ASP-PFD-21 gunsight. The MiG-21SM Fishbed-J made its maiden flight in 1967 and remained in production at GAZ-21 in Gorkii for the Soviet Tactical Air Force between 1968 and 1971. In total 349 pieces were made. From the late sixties eight Soviet regiment received MiG-21SM Fishbed-J. Each regiment used single-seat 40 - 44 aircrafts. 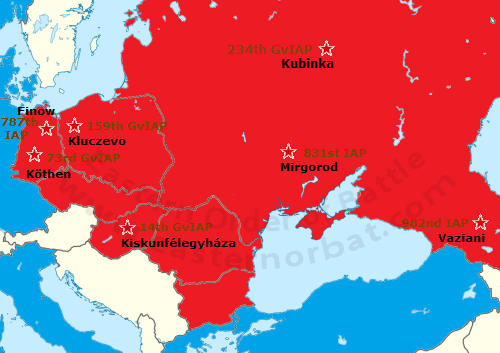 In the seventies, seven regiments served in Europe, one regiment in the Soviet Far East. 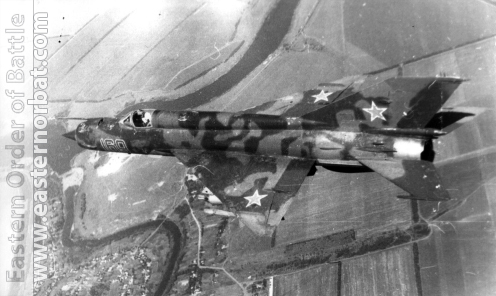 At the end of the seventies the MiG-21SM Fishbed-J fighters also received camouflage. This type was withdrawn from the first line between 1978 and 1980. The most important new component, incorporated into the MiG-21SM’ new mission suite, was the vastly improved RP-22S Sapfir-21 air-intercept radar, using a twist-Cassegrain antenna and featuring the monopulse target directionfinding method. This method provided notably better resistance to both passive and active jamming compared to the conical scanning, as used by the were typically detected at 30km and tracked at 15km, while against fighter-size targets the RP-22S’ maximum detection range reached 18km and tracking range was up to 11km. The RP-22S’ analogue processor calculated the minimum and maximum R-3S/R-3R launch ranges depending on the altitude and closing speed, generating the ‘launch permitted’ and ‘break’ commands. The new radar was introduced together with the new R-3R (AA-2B) semiactive radar homing (SARH) missile which had a range of 0.8–7km; it was used for all-weather intercepts and was suitable against non-manoeuvrable targets. After launch, the fighter was free to manoeuvre within a limited space, keeping the target within the radar’s gumball limits (30° up/down and left/right) as the R-3R homed onto the reflected signal from the target, continuously tracked by the RP-22S. The radar’s rangefinding function provided the pilot with information about the maximum and minimum missile launch ranges at different altitudes and closing speeds (displayed on a mechanical needle display on the ASP-PFD-21 gunsight). It also supplied range information for the employment of the GSh-23L 23mm cannon against air targets and for firing both the gun and rockets against ground targets. The SPO-10 Sirena-2 RWR was also incorporated into the mission suite of MiG-21SM Fishbed-J aircraft. It had antennas looking back from the top of the fin; and the cockpit indicator provided the rough direction of any radars ‘painting’ the aircraft, with 45° precision in azimuth. The gunsight was the new ASP-PFD-21 lead-computing gyro unit, enabling more precise firing against air targets with the GSh-23L cannon as well as generating better aiming information for using the cannon, rockets and bombs against ground and sea targets. The gunsight, however, ‘toppled’ at 2.75G, thus limiting the ability to aim the GSh-23L cannon in a high-G turning dogfight. 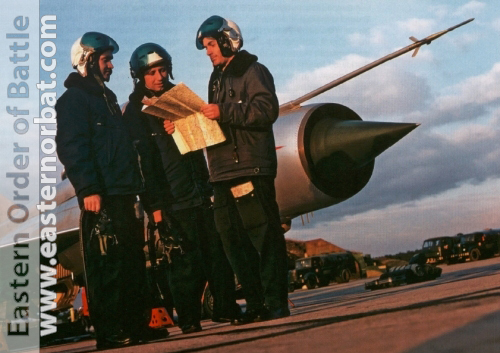 The MiG-21SM Fishbed-J also incorporated an improved Lasour-M datalink for receiving steering commands from a ground-based intercept control station. The armament of this vastly improved Fishbed derivative was enhanced in 1974 with the addition of the R-13M AA-2C heat-seeking missile, an enhanced derivative of the R-3S AA-2A missile incorporating a modernesitive nitrogen-cooled infrared seeker and boasting better agility and extended range; it also bestowed some reduced manoeuvring limitations on the launch platform. The typically a combination of two R-3Ss or two R-13Ms and two R-3Rs, or two missiles on the inner pylons and two 490-litre drop tanks on the outer pylons. 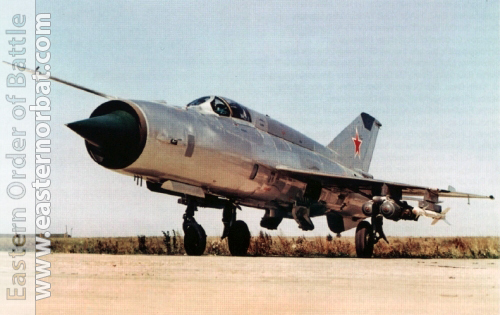 During the late 1970s the weapons control system of many of the MiG-21SM Fishbed-J aircraft was modified to give it the capability of firing the highly agile R-60 AAMs. The underwing pylons also received the BD3-6021D adaptor beams for carrying the MBD-2-67 multiple bomb racks and the UB-32M 32-round rocket packs. The SPS-141MVG Gvozdika is pod-mounted on the MiG-21SM fighters. Jams two distinct bands. It works in four modes: individual protection, two-aircraft protection (both aircraft having the SPS-141, cooperating with each other in jamming the enemy radar), "Doppler noise" mode, and low-level mode, where the equipment uses the terrain bounce effect in jamming. In the eighties this type was removed from the first and second-line units. 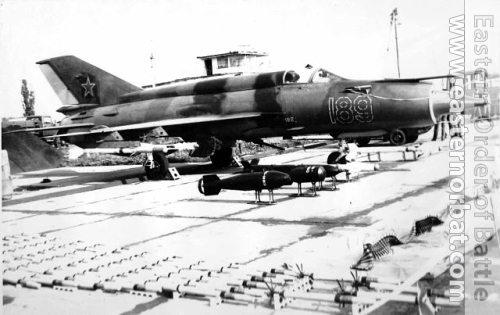 The first MiG-21SM Fishbed-J arrived in 1979 to the training units. 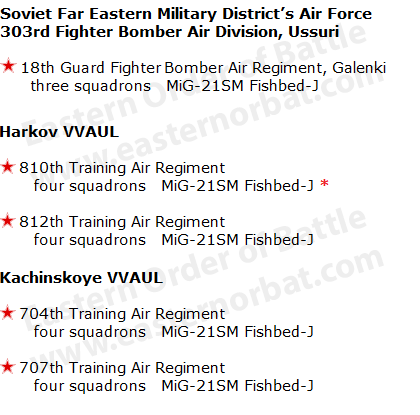 The training air regiments in Kachinskoye High Military Aviation Order of Lenin Red Banner School for Pilots and Kharkov High Military Aviation School for Pilots were filled up by the middle of the eighties with MiG-21SM Fishbed-J. 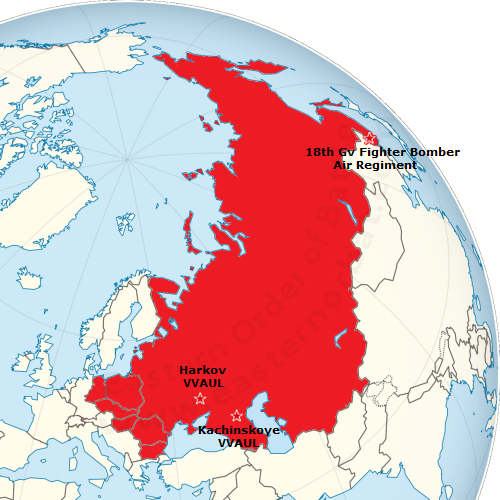 Apart from them only the 18th Guard Fighter Bomber Air Regiment used the model at the Soviet Far East. 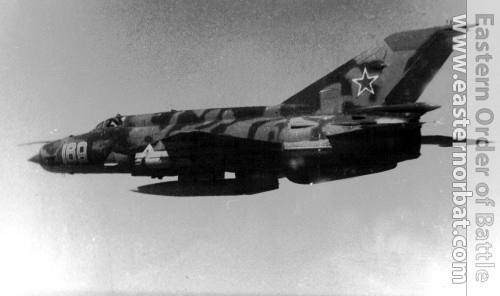 In the eighties about 250 MiG-21SM Fishbed-J flew, they formed the Soviet Tactical Air Force's reserve. 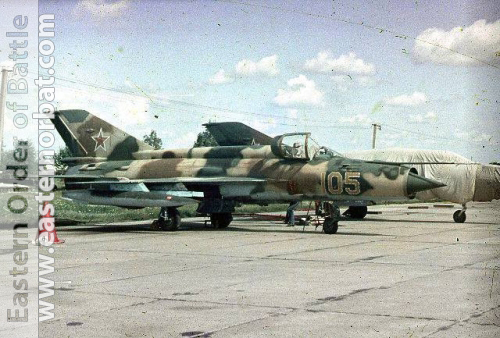 The 18th Guard Bomber Fighter Air Regiment replaced them with MiG-27D Flogger-Ds in 1989. 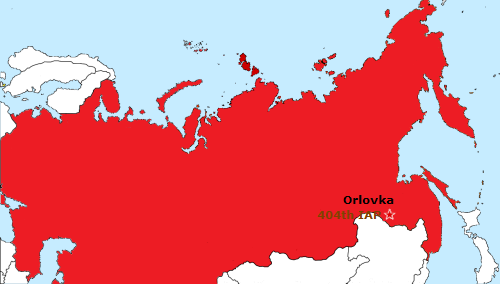 Then after the dissolution of the Soviet Union four training regiments ceased to exist. 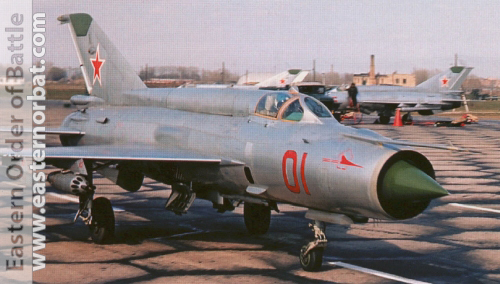 The MiG-21SM Fishbed-J type was withdrawn in 1993.